Meanwhile, more research is needed to fully understand the worldwide impact of mercury on different ecosystems. Although the global cycle of mercury has been characterized to a certain extent, and the mechanisms leading to the transformation of inorganic mercury to the highly toxic form of methylmercury is well understood, there are still a lot of unknowns related to the regional and local characteristics of mercury deposition and its effects on specific ecosystems. Since the time of the Minamata disaster, and especially during the last two decades, most people have been aware of the danger lurking in our oceans, particularly in seafood. For example, pregnant women are advised to avoid fish known to contain high levels of methylmercury, to prevent the development of major neurological disorders in the unborn fetus. However, despite all the emphasis placed on the presence of mercury in waterways and, therefore, in fish consumed by large segments of the human population, mercury can be found in other places and in amounts that adversely affect the environment, including soil, wildlife, and so on. Fortunately, there is now more interest on “largely ignored” mercury-polluted ecosystems. Two recently published studies focus on the montane environment and how altitude influences mercury concentrations. Hua Zhang and collaborators examined topsoil samples along an elevational gradient transect on Mt. Leigong in subtropical southwestern China. The results of the study, published November 25, 2013, show for the first time that the content of mercury derived from the atmosphere distinctly increases with altitude. The authors provide potential mechanisms for this so-called altitudinal magnification effect or “mountain trapping effect” (see figure below, from Zhang et al. 2013, Scientific Reports 3:3322). 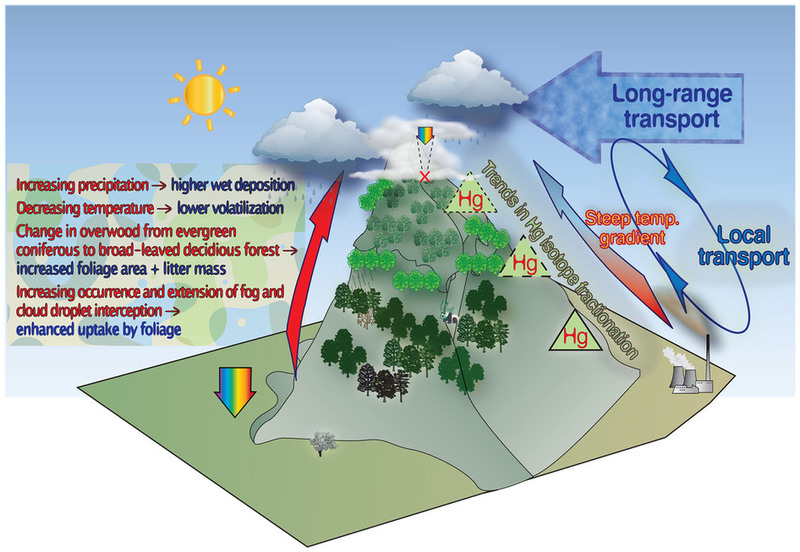 But how does mercury present at higher altitude affect the forest floor and fauna? The answer comes from a new study published in Environmental Toxicology and Chemistry, by Jason Townsend and colleagues and titled “Avian, salamander, and forest floor mercury concentrations increase with elevation in a terrestrial ecosystem” (December 3, 2013). The study focuses on a high-elevation ecosystem of the northeastern United States – the Catskill Mountains. The investigators found that elevation and the ecological and climatic changes that occur along elevational gradients have a major influence not only on the environmental concentrations of mercury but also on the bioaccumulation of mercury in montane wildlife – birds and salamanders. Indeed, results from the study show that montane animal species bioaccumulate higher concentrations of mercury than their lower elevation counterparts. Importantly, the study shows that most mercury in terrestrial birds and salamanders is present as methylmercury, the biologically available, highly neurotoxic form of mercury found in fish and known to move efficiently through food webs. Thus, atmospheric (ionic) mercury can be converted to methylmercury in forested, terrestrial sites well removed from permanent bodies of water. It’s time to accept the idea that mercury contamination is not limited to seafood – and it’s time to carry out further studies to accurately assess the extent of the problem in terrestrial ecosystems. Concern should not be limited to sea food, and, sourcing should not be limited to burning of coal. Another source that nobody seems to take note of is from crematoria vaporizing dental mercury out across the landscape waters, soils, and breastmilk. Forest fires remobilize sequestered mercury as well. Growth of forests, rather than burning lots of wood, could be a tool to begin sequestering mercury to a greater degree.